When exploring the woods and fields of the Great Plains, a curious naturalist will usually be on the lookout for dangerous animals such as skunks or venomous snakes, but might not give any thought to the possibility of encountering a dangerous plant. Of course, plants cannot “attack” a person, but some plants can cause harm if they are touched. One plant that should definitely be avoided is Poison Ivy, and that can be a real challenge because it grows in different forms, does not have a consistent leaf shape and there are some plants in the same habitat that look like it! Poison Ivy is a woody vine or sub-shrub that has a very wide distribution. It may be found coast to coast from southern Canada to Mexico. It is also known from the West Indies and China. It is a member of the Anacardiaceae, or Cashew, family. Most members of this plant family have a tropical or sub-tropical distribution. In North America, it is represented by the Sumacs (Rhus sp. ), Poison Ivy, Poison Oak, Poison Sumac and the Florida Poison Tree (Metopium toxiferum). Poison Ivy is a nuisance because it contains a chemical that can cause the skin of persons sensitive to it to develop a red, itchy rash and even erupt in blisters. 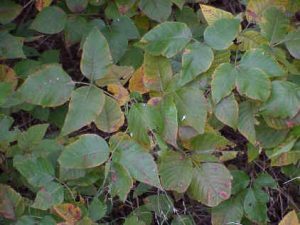 Urushiol is the active ingredient in Poison Ivy that causes the rash and irritation. 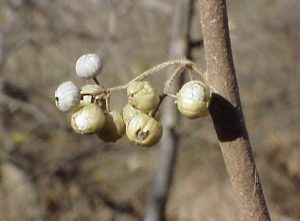 It is present in all parts of the plant, but particularly in the sap. People vary in their sensitivity to urushiol. Some have no problem with it and others experience severe allergic reactions. This can also vary over the life of a person. You might be unaffected as a child and become sensitized with repeated exposures. So even if you are not allergic now, it is a good idea to learn how to recognize Poison Ivy in case your body changes as you age. The clinical name for the skin irritation caused by Poison Ivy is Rhus Dermatitis. It usually starts as itching and small blisters within a few hours after exposure. Depending on how strong the exposure was and/or how sensitive the person is, that may be all there is to it. However, it may develop into an inflamed, swollen rash with open, weeping sores that persists for up to two weeks. Severe cases may require a visit to the doctor. Urushiol is absorbed into the skin within three minutes of exposure. If it is washed off quickly with dishwashing soap and water, the consequences will be less, but you are seldom close to a lavatory when you get exposed, so learning to recognize and avoid it is the best strategy. An important fact to remember is that the urushiol can travel on your clothes or the fur of your pets, so remember to wash them too if you suspect they were in contact with Poison Ivy. As a ground cover – It can creep across the ground surface and make a knee-high thicket of foliage. This is what is shown in the picture at the top of the page. As a skinny free-standing “shrub” – It can grow in the open with one stem and only a few side branches. It may be up to ten feet tall in this form, and this is the form that people call Poison Oak. (According to the experts, Poison Oak is a distinct species that doesn’t occur on the prairie [see below], but for all practical purposes they look the same and BOTH should avoided). As a vine – Using thin, brown, aerial roots, it can attach itself to the side of a tree or other object and reach high into the sky. This is the form where it reaches it greatest size. 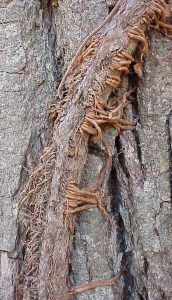 It is not uncommon to find vines as thick as your arm growing up the side of large trees. Poison Ivy is often confused with another woody vine, Virginia Creeper (Parthenocissus quinquefolia). 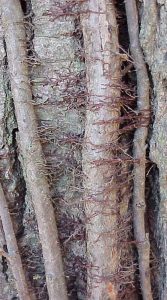 Notice how much bigger and lighter colored the tendrils of Virginia Creeper are compared to the aerial roots of Poison Ivy. Both the vines shown above are about as big around as your thumb, and were growing on the same tree. The fruits of Poison Ivy are grapelike clusters of tiny, white, pumpkin-shaped seeds with an off-white or pale yellow rind. The photo below was taken in mid-November and shows that the rind dries out and flakes off eventually. The fruits also contain urushiol, but that does not stop the birds from eating them! Flickers and other woodpeckers are fond of them, along with sapsuckers, thrushes, pheasants and quail. The rind provides food to the birds while the seeds usually pass on through their gut unharmed and, in this way, birds are the agent for dispersal of Poison Ivy seeds. The shape, color and texture of the leaflets is highly variable. These shown on the right have fairly smooth margins, but others may have rounded teeth or lobes. Poison Ivy has compound leaves. That is, each leaf is made up of distinct parts, called leaflets. In this case there is one leaflet at the end of the leaf stalk (or petiole) and two leaflets opposite each other below the first. This is called a trifoliate pattern. The two lower leaflets have very short stalks and are often shaped like mittens, with a lobe on one side. The leaves are not attached to the twigs directly opposite another leaf. This pattern of leaf arrangement is called alternate. Aromatic Sumac (Rhus aromatica) Also known as Skunkbush, Aromatic Sumac forms dense thickets up to 7 feet tall. It is native to the eastern half of the U. S. and is often used for landscaping purposes and stabilizing eroding slopes. In the wild, it will be found on rocky outcroppings and fence rows. Its berries are red and densely hairy and form in dense clusters. 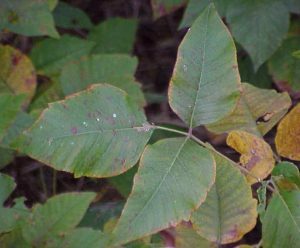 While in the same family as Poison Ivy, it does not contain urushiol. Box Elder (Acer negundo) A member of the Maple family, Box Elder has leaves that strongly resemble Poison Ivy in spring, but later in the year has leaves with 5 – 7 leaflets. Also, its leaves are directly opposite each other on the twigs, while those of Poison Ivy are alternate. It becomes a medium sized tree and has the typical paired, winged seeds that are common to Maples. It does not contain urushiol. Eastern Poison Oak (Toxicodendron toxicarium) The range of Eastern Poison Oak includes eastern Oklahoma and the adjacent counties in southeast Kansas. It is otherwise absent from the Great Plains. Its leaflets are smaller and have more lobes than those of Poison Ivy and it always grows in a shrubby form. Its fruits are similar to those of Poison Ivy, but usually hairier and larger. It does contain urushiol and should be avoided. 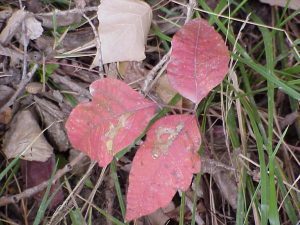 Poison Ivy leaves turn a vivid red color in the fall. It is usually one of the first plants to change. This touch of beauty on the landscape is, perhaps, a small repayment for all the misery it causes!